I am so excited about the new Kate Campbell album! Kate Campbell is one of my favorite singer-songwriters. I first heard about her music from Melissa the Missionary, who sent me two mix cd's when I was living up north. "You need to hear 'South of Everything,'" she said, and she was right. I listened to that song just about every day in Connecticut, thinking about home and which direction I'd rather be headed. I love her songs because they are smart, funny, and poignant. Songs like "New South" and "Jesus and Tomatoes" are hilarious. She's one of the few songwriters I know who can express the tensions of the Civil Rights movement and modern-day race realtions in songs like "Look Away" and the heartbreaking "Bear it Away. "She's released albums of hymns and covers in the past. The new album consists of both. The first time I saw Kate Campbell was at a small coffehouse in Bridgport, Connecticut. I dragged my best friends to the show, sang along, and bought the albums I didn't have. It was so much fun and such a reminder of home. This summer I got to hear her play again at the Baptist Center for Ethics luncheon at CBF. She played a haunting rendition of "God of Grace and God of Glory" and the room grew silent, because it is the right song for our era of "warring madness" and people who are "rich in things and poor in soul." There's a call away from those superficialities in Campbell's music. We'd do well to listen. Today's quote of the day comes from one of our darling GA's, last night while we were playing a game about taking care of the environment. GA director: "Name one thing your family puts in the recycling bin." Cute first grader from a family that's been visiting our church: "Um, bottles. Beer bottles." The GA director nearly died. I nearly died trying not to laugh. Poverty's in the news again. I usually teach in a class on poverty and politics this time of year, but not this fall. It's one of my favorite classes because it brings together a mix of students from all kinds of background. A passionate discussion inevitably breaks out when I ask, "What causes poverty?" and a sorority girl says, "Laziness" and then a student who grew up in poverty lets her have it. It happens every time. It's really remarkable. And it's so much fun to help the students think about the complex causes of poverty in the U.S. and around the world, and to see them realize that complex causes require complex solutions that go way beyond the simple suggestions of the political right and left. The class is especially interesting since the census bureau always releases annual poverty statistics during the first week of class. Just like clockwork, those numbers came out yesterday. For the first time in the Bush presidency, the poverty rate stayed the same this year. Every other year he's been in office, the rate has increased. I guess that's something. In Texas, however, things are worse. 17.6% of our fellow Texans live in poverty. Despite the fact that we are resource-rich and have plenty of wealth to go around, we are in the company of states like Mississippi and New Mexico in terms of the number of people who live in poverty. This is, by the way, all a gross underestimate of the actual number of poor Texans and Americans. The poverty line in the U.S. is not an accurate measure of who is actually poor, who is actually incapable of meeting basic expenses month-to-month. Something most of my students, and I think also many Americans, are not aware of is the fact that it is possible for a two-parent family to have two adults working full-time and still be poor. Minimum wage is so low that in Austin, for example, you can't support a family of four on two full-time, minimum wage incomes. It's very difficult to escape such a situation, too, because you don't have time to develop skills that would enable you to get a better-paying job. I was thinking about all of this last week while watching Spike Lee's documentary When the Levees Broke: a Requiem in Four Acts. It is an incredibly powerful film about Hurricane Katrina and America's realization that there are poor people in our country. I missed a lot of the coverage of the hurricane last year - I'd just gotten back from the Congo and didn't have television or internet access. So it was amazing to me a few days later to see serious discussions about the fact that there are American citizens who can't afford to evacuate when a major storm is headed to their homes. It's so easy to forget about the poor, especially the working poor. Most of us live in the parts of town where we don't see our neighbors struggling to make rent. We don't hear kids coughing because they don't have health insurance to see a doctor before they get really sick. It's a problem that is especially acute when it comes to America. We're pretty good at ignoring global poverty, too, but things like the ONE campaign are making us more aware. My church has a global hunger banquet every year to remind us of the issues surrounding global poverty, and other churches are starting to have similar programs (Ethics Daily has a new resource for this if you're interested in doing a global poverty emphasis at your church.). This is good. And it's good to go spend a day building a Habitat house, or to do yardwork for a senior citizen who finds that her home is now on the wrong side of town. But we would do well to remember, as Southside Community Shelter director Ruben Garza says, that, "Those who were barely making it are not making it." There was a POV documentary on the working poor that aired earlier this week. I missed it, but I will definitely be catching it. There's something fundamentally unjust about people who work hard never having a chance because the deck is stacked against them. How can we serve the working poor? The idea of starting a blog about my dissertation started one day in 2005 when a colleague mentioned that she'd become obsessed with some of the academic blogs that are out there as rants on research, students, and the tenure track. I didn't really want to blog at that point, but six months later I was riding a bus over the Rwandan mountains for the fourth time in a month, and it occurred to me that a blog would be a really good way to keep my family and friends updated on the long research trip to Congo that would begin in the winter. I felt bad about sending them email updates every week of that first trip and thought this would be a way that people could choose to (not) find out what I was up to on that crazy adventure. So that's what happened. When I got back, sometime the name "Texas in Africa" came to mind and nobody'd thought of that one, so it was easy to get the blog name and the email account. And I started posting. Mostly on stuff that didn't matter, and mostly just to get in the habit so that when the time came, I wouldn't forget about it. And a few of my friends started reading. And then I went back to the Congo, and then a lot of people started reading my blog, and I don't know who was reading it. Then Ethics Daily gave it a plug, then I got on the Mainstream Baptists favorites list, and all of a sudden I'm getting hits from all over the place. And it's cool, but it's also a little unnerving, because I'm not sure that I do a good job of saying what needs to be said. Here's what I like about blogging: it's a voice. It gives me a place write, and to share things that I'm thinking about, or that are really funny. It's a way to keep a journal that's more engaged with current events and culture than the paper journal I keep. It's also been a great way to reconnect with friends who live far away and who I never get to see. And some who are a lot closer to home. Hre's what I don't like about blogging: it creates, as the Intrepid Lobbyist put it last month while we were walking around DC late one night, a false sense of intimacy. Perfect strangers read my blog and start feeling like they know me well. My friends read the blog and figure they know what's going on in my corner of the world, and so we don't talk for months. "I feel like we had a conversation," said the DA a couple of weeks ago. But we didn't. That's what's so disconcerting. I do write about some things that happen to me here, but 99% of what I do and who I am and what I think never makes it to my blog. I don't have time to write it all down, and even if I did, I wouldn't. Some things are too personal, too private for strangers. Some things I don't think are fair to other people to write about, like serious conversations and dates and students. Some things I want to talk about in real conversations, with people who can be present and give advice and for whom I can do the same. So I've thought about quitting the blog. I value the reality of relationships and human contacts much more than I value having a space to reflect and/or self-promote. And truth be told, I'll be Ta-ing and teaching a class this fall on top of writing my dissertation, and I really don't have time to blog. But then I think about how cool it's been to reconnect with Emily and Jess and others through the blogosphere, and how much I would miss knowing what's up with them if they quit. And I think about the people who are trying to create a community of young, moderate Baptist bloggers, and I feel a responsibility to keep trying to say something. And I think about the Congolese, and I appear to be the only American Christian blogging about what's going on there, and I feel called to keep their stories on our minds. So I think I'll keep it going, at least for awhile. Thank-you for reading, and thank-you for coming back even though most of what I write is far from profound. Thanks for being my friends, thanks for telling your friends about Texas in Africa, and thanks for being willing to read the reflections of a total stranger. Thanks for your comments and emails and quotes. Don't let this be a one-way form of communication. Start a blog so I can link to it. Email and tell me what's going on in your life, and I'll write back. And keep checking back here, 'cause I won't be writing about SOIUTK's latest nonsense or that ridiculous thing my student said, but it'll be amusing and thought-provoking nonetheless. I promise. Well, I have to hand it to Rick Perry. Depriving the people of Fort Bend County of representation for several months so you can pull the political trick of the year was pure genius. Emperor Goodhair has called for a special election to fill Tom DeLay's vacant seat. For the same date as the general election. So, there will be two elections: one to determine who holds the seat from November - January, and another to determine who will hold the seat from January 2007 - January 2009. You will recall that the Republicans tried to pull a fast one, the courts (including Scalia) said no, and so they have a write-in candidate for the general election. So why is this a smart political move? Because it means that, if they choose the same candidate (which they will), her name will be on the ballot. Getting voters to spell/remember a candidate's name correctly is one of the most difficult parts of running a write-in candidate for office. Thanks to this move, voters will be able to cross reference Shelly Sekula-Gibbs on the other part of their ballot, thereby giving the Republicans a chance. Assuming she runs. As The Librarian points out, whoever came up with that deserves a cushy political appointment. Rick Perry, Texas in Africa salutes your staff and party operatives for brilliance in playing politics with political representation. Read between the lines. Sweet! I am SO looking forward to Friday, October 13 because that's the day when: 1. The final Lemony Snicket book comes out, and 2. I will be seeing Wilco in San Antonio! Could it be more perfect? Let me be the first to call for a boycott of Stubb's. Sorry for the lack of posting lately. I drove back to Texas yesterday and have been running around filling out forms, getting mail, and now the real fun begins. Ugh. Well if this doesn't bring a tear to your eyes, you're clearly not from around here. Note to self: if children are to be born outside of Texas, have husband bring West Texas dirt to hospital. (You think I'm joking. My sister actually got recruited to stop by the side of the road to get a jar of Texas dirt for a woman who expects to die in Tennessee. She wants Texas dirt in her grave.) Clearly, dirt has something to do with making a quarterback a Texan. As for the heir apparent, we're okay with him not technically being a native, but what remains to be seen is whether he can he throw a pass. Six days and time will tell. 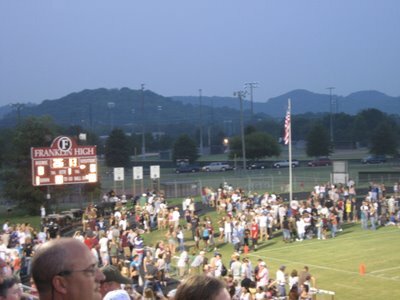 Since I was in town a few days earlier than planned, it worked out that I could go to the Franklin game with Daddy! It has been forever since I've been around for a Rebels home game. Things have changed! The scoreboard is a lot nicer, the scary old concrete stands on the visitors' side have been replaced, the team has better uniforms and matching shoes, the band uniforms are better, etc, etc. Another thing that is very different is that the Rebs are ranked #4 in the mid-state. Who'd've thought? Right Emily? The game was okay. They played Murfreesboro-Oakland, which is definitely not the powerhouse it used to be. They do, however, have a running back named Precious Valentine, so that made for some fun calls, both from the booth and from the stands ("Nobody wants to tackle Precious.") But Franklin more or less ran right over Oakland, 38-13. That score does not reflect how sloppy the offense was - tons of mistakes and turnovers. 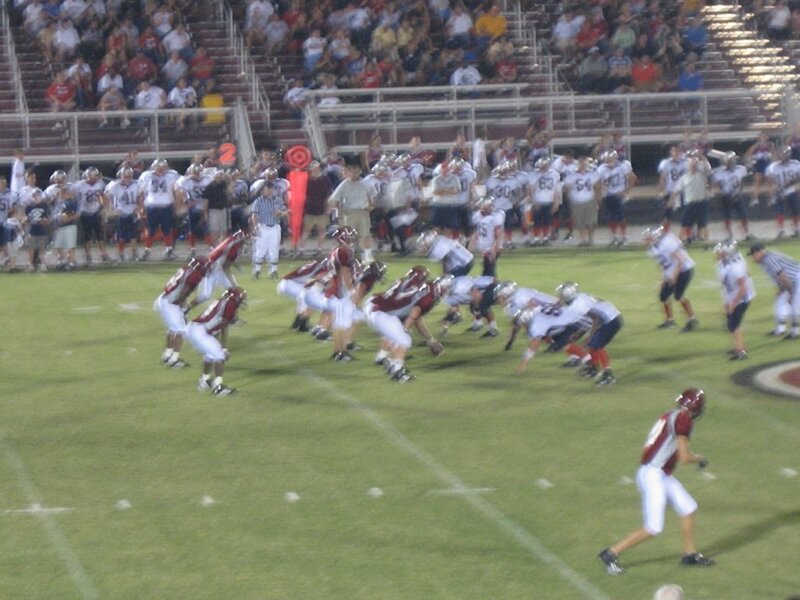 The defense is solid, but I'm not sure they'll be good enough to hold off Ravenwood next week. All in all, it was a fun evening. I got to hang out with my daddy, see some old friends, and watch a game in a stadium with one of the prettiest views I know. Go Rebs! How interesting that the Republican party is losing points in polls on whether the party is "friendly to religion" or not. What's even more interesting is that the drop is 14 points among white Evanglicals and 11 points among Catholics. I wonder if it's attributable to the fact that the Bush administration hasn't actually done anything about abortion, gay marriage, or most other social conservative issues. In other words, is the party losing support from conservatives who want a more socially conservative government? That would be my guess, because I seriously doubt that that many people whom pollsters identify as "religious" have suddenly decided that the Democrats are more friendly to the religious - that number stayed virtually the same as last year. At any rate, polls like this suggest that we really are in for a major shake-up this fall. I think it also suggests that the time is right for candidates who understand that it is an abuse of faith to use religion as a means to political power, but who also understand the powerful motivation that comes from faith concern. Barak Obama comes to mind. I think John McCain is also politically astute enough to walk that fine line. Whether the parties will respond to such an atmosphere - and nominate 2008 presidential candidates who would offer our country a mature dialogue about these issues - is unfortunately very unlikely. Thanks to Laura the Elder for today's quote. I'm not ready to leave. Here's what happened: I got a job. In the course of forty-five minutes yesterday, I got an email from Committee Member #2 that a small college in Austin needed a last-minute replacement for an adjunct instructor. I said, "why not?" and emailed in my cv. A friend happened to be standing in the office when they received my cv, he vouched for me, my phone rang, I said, "yes," called my mom, changed my flight, told Ms. Security I wouldn't need to sleep on her floor this weekend after all, found a place to stay in Austin, re-did the syllabus they sent to fit my teaching philosophy, sent emails to cancel plans with friends here, called my mom again, and all of a sudden I am teaching my own class, entirely alone, for the first time in my life. I am thrilled and terrified. And I'm not ready to leave D.C. There were so many things I'd planned to do this week. I didn't finish at the LOC. I didn't go to see Ken at Arlington. I didn't get over to Eastern Market again. I didn't get to see the Building Museum. And I didn't get to go to the Lincoln Memorial again. I know a lot of people like the Lincoln, and given who I am, I should probably like the Jefferson memorial better. But the Lincoln Memorial has been a touchstone in my life. I seem to end up there when I'm wanting something for my life that is exactly wrong. I stood on its steps at age 17 when I really, really wanted to go to Georgetown. I stood there again at 22 in the middle of the interview day for the foreign service. I stood there after a weekend with SIUTK and his family. I stood there with teenagers on a mission trip. And I went out early this summer in the miserable heat to think about what to do next. I go there again and again, to think about calling and love and life, and to read the Second Inaugural with its heartbreaking line, "And the war came," and Lincoln's understanding that North and South prayed to the same God. We'd do well to think about that when our wars come. The Lincoln is different at different times of day. 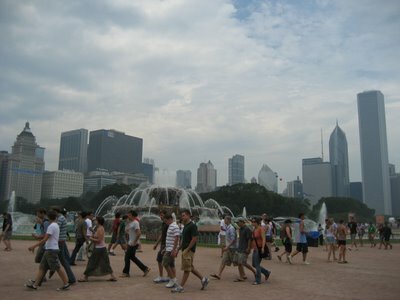 On a hot summer afternoon, tourists swarm. At sunset, joggers and children run up and down the chair. On a clear winter afternoon, State Department workers stand on the steps to catch some sunlight. Very late at night, it's almost deserted, with spotlights providing the only light. I love going there no matter what it's like. And now that I have an Actual Teaching Job, I would have liked to have gone again. Maybe next time. Our season tickets showed up this week. We're nine days from kickoff. Where did all the time go? It seems like just last week that we were in Pasadena, walking down the street being kissed by strangers (That, fyi, is what happens when you bring a Texas flag to the post-game celebration on Colorado Boulevard.). I can't watch the game film enough, although I should buy the uninterrupted game DVD because the i-tunes highlights reel is getting a little old. Kindof. So despite the fact that some meddling Aggie wants to interfere with our new jumbotron (largest in the world until they finish that one in Japan that's three feet bigger), it's looking like this will be a pretty good year for Texas football. Sports Illustrated rankings aside, I'm not convinced that this year is going to be a cakewalk for our boys. Yes, we have a great defensive line, and yes, Jamaal Charles is amazing, but we do have this little quarterback situation, and that's not going to be easy to overcome. Colt McCoy needs experience, and I'm really afraid that his confidence will be shaken on the 9th against Ohio State. My prediction? 11-1, with a loss to Ohio State. Then again, I could be wrong - their offense has been overrated the last two seasons and there defensive line won't be nearly as good as it was last year. They'll also be playing in heat and humidity that they're not used to. We'll have a tough time against the Aggies and the very talented Stephen McGee, but we'll get the job done. OU won't even be fun now that Bomar's out. (Wait, what am I saying? Of course it will be fun). We'll top Nebraska for the second time in the season at the Big XII championship, and go to the Fiesta Bowl, which is a week too early to be in Glendale. If I'm wrong and we beat Ohio State, we'll play Notre Dame for the national championship, and will probably lose. Quiinn and Samardzija are incredibly good, and Notre Dame needs and wants the championship more than we do. As for other teams, this is Baylor's year. They're implementing a Mike Leach-style offense, and they finally have some confidence after nearly beating OU and A&M last year. If they're ever going to make it to a bowl game again, this will be it. I might have to cancel my travel plans to go watch them play in the Texas Bowl. This will not, however, be Yale's year. 2/3 ain't bad. That's my opinion, for what little it's worth. But I did call it last year (in May!) and scheduled my travels accordingly. I'm planning to be overseas this New Year's. I miss Congo. I've been reading all these blogs by people who are still there. I've been thinking about my friends in Kinshasa, hoping they are safe. I've been thinking about my friends in Goma, who are probably wondering why on earth Kinshasa can't get its act together. I've been thinking about the smiling women at the DOCS hospital, about the little girls with blank stares on their faces, about 2,000 orphans running in circles at a huge party. I've been thinking about dancing to ndombolo music with Gisele and Aime and all their friends. I've been thinking about long talks with the FWF about development and war and Wilco. I've been thinking about the mist rising off the Masisi mountains early in the morning, about the light on Lake Kivu at sunset, about smoke rising from Nyiragongo volcano, about the sweep of the Milky Way on moonless nights. Christianity Today gives Barak Obama some credit. I saw this and had to temporarily rethink all my preconceived notions. But then I read the second part of the editorial, which talks about the role of "specifically Christian resoning" in history's great crusades for civil rights. They say that Obama, who says that religious voters have to come up with secular reasoning for public policies that affect everyone. CT says, fine, but Martin Luther King's reasoning was religious. That's true. The problem with CT's analysis is that the reasoning behind the Civil Rights Act and other legislation and policies designed to promote equal justice, while they may have been firmly grounded in Christian notions of justice, could also be justified on basic principles of fairness and of the equality of all people before the law. Because I'm a Christian, I believe that all people are equal because all people are created in God's image. But you don't have to subscribe to a specific Judeo-Christian idea to believe that people are equal and should be treated fairly. Contrary to what CT's editors say, America is not "far and away a Judeo-Christian nation" in a legal sense. Our system of rule demands respect for minority rights. Requiring a secular justification for religiously-motivated laws is a good way of holding the majority in check, and ensuring that we aren't subjected to the tyranny of a theocracy. That's what Obama is pointing to. That's why his involvement in politics is so exciting to just about everyone I know who is of a moderate persuasion. Here's a politician who understands that faith is important, and that we have deeply held beliefs that motivate our policy positions. But he also understands that there's a danger in thinking you always have the right answer simply because you are a person of faith. That's the kind of nuance that is misisng from our politics. We need more people like him. Plus, you know, he lives in Ali's building. If you are running for public office, or running a PAC that's trying to influence politics through cash and in-kind donations, you are not "the man in the street." You and your campaign are responsible for hiring or obtaining the volunteer services of a professional who can interpret campaign finance law for you. In Texas, this isn't even a little bit challenging. We only have ONE campaign finance law: you can't spend corporate money on political activities in your campaign. Corporate donations can be spent on purely administrative costs - things like rent for an office or electricity to keep the lights on. Corporate money cannot be spent on political activities like printing campaign signs, or running a phone bank that encourages people to vote for a candidate. The law is designed to keep businesses from having too much influence over politicians. It doesn't work very well, because individuals can still give unlimited personal donations to campaigns, and you'd better believe the officials who get elected as a result of those donations remember what comapny their donors own. Of course not. And the TRMPAC lawyers understand that. What they are actually arguing is that the law is unclear on whether money-laundering is illegal. The most interesting aspect of the TRMPAC case is that no one disagrees on the facts of the case. TRMPAC collected $190,000 in corporate donations and sent it to the Republican National Committee, which in turn donated a total of $190,000 to seven candidates for office in Texas. $190,000 went in, and $190,000 came directly back to the candidates TRMPAC wanted to get elected. Does anyone honestly believe that money-laundering isn't a violation of both the spirit and letter of the law? (Does anyone ever believe that money-laundering is okay?!?) You're not supposed to be able to use money that came from corporate donations for political activities. The sense of being above the law for a perceived just cause is symptomatic to anything having to do with Tom DeLay. It's so simple. This is scary. 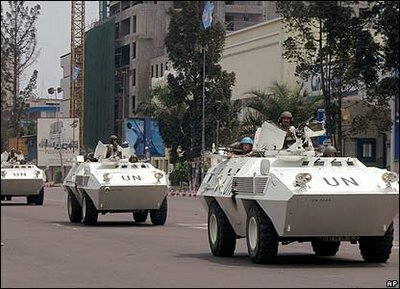 It is so disconcerting to see nothing but tanks on the Boulevard 30 Juin, Kinshasa's main drag. Normally, the street is one big traffic jam of taxis and private cars inching the four miles between the leafy residential neighborhood of Gombe and the embassies, government buildings, grocery stores, and banks of downtown. I hope my friends are safe. I hope they don't have to evacuate. 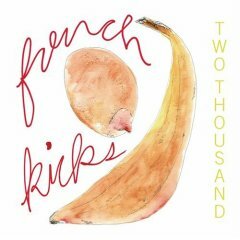 I'm in love with French Kicks and their new album Two Thousand. It's catchy, fun, indie-pop. The first track, "So Far We Are" is ridiculously addictive. You can listen to it here, or they're playing it approximately every ten minutes on KEXP. They play at Emo's on September 21. It's perfect August music. Apparently I should be selling my ticket to the OSU game. Things are getting a little scary in Kinshasa. Check out the pictures of smoke rising from Bemba's (the runner-up in the first round of elections) compound yesterday. Western diplomats who were visiting Bemba were trapped there for several hours before being rescued. "The embassy is advising all American citizens to remain indoors at home after dark until the situation stabilizes. In the event of gunfire in the vicinity of home, the Regional Security Officer (RSO) advises staying away from windows in an internal room." That was written by someone I know from my intern days. She's not prone to exaggeration. This is because Sunday night there was gunfire in Gombe, the Kinshasa neighborhood where diplomats, the president, and basically everyone who's an expatriate lives. It's where I stayed when I was in Kinshasa in March. Kasonga says "We're all members of the same army." That's the problem. Technically, yes. Really, not so much. Have you ever thought about what it would mean to live in a place where different battalions and units of the army are loyal to different political factions? When that's the case, everything you know about how a military works and how a state stays secure goes out the window. Add that to the fact that Bemba (and others) have private security forces and you've got a recipe for disaster. Or coalition-building, if you're more inclined to take the optimistic view. Check out the electoral results map - you think we've got problems in red and blue America, where vote totals are close to 50/50 in many states. 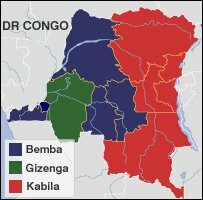 There's a regional divide - Kabila, who speaks Kiswahili and comes from the Kiswahili-speaking east, won the east. Bemba, who speaks Lingala, won the west, where Lingala is the lingua franca. Gizenga won in some western provinces, but only got 13% of the national vote, so he's out of the running for the presidency. In Bukavu in the eastern DRC, 97% of the population voted for Kabila. If you're living there, you probably don't know anyone who voted for Bemba. There are likely to be people in Kinshasa who won't believe that 44% of the electorate nationwide voted for Kabila. So they're going to be more likely to see it as fraud. It's exactly like the U.S. in 2000 - my friends up north found it incomprehensible that anyone had voted for George W. Bush, and were convinced that there were serious electoral code violations in Florida that year. My friends in Texas couldn't understand what the fuss was about. Politics are more-or-less the same everywhere. Only in America, we theoretically abide by the rule of law. And no one gets to have a private army. Unless of course you're starting an amateur border-patrol. So you take what seems like unbelievable election results and add it to the existence of private armies and a national army that has little to no cohesion nationally and there could be really serious trouble. In other Africa news, my friend Eddie has a story on preparations for Senator Barak Obama's upcoming visit to Kenya. He does a great job putting the visit into cultural context - you just don't go back home to western Kenya without bringing the benefits of your success along in material form. Well, what a distinction. I really think there should be something about students' total lack of creativity in making excuses for the work they didn't get done, the paper they didn't hand in, and the exam they slept through. A note to my future students: No one has six grandmothers die in one semester. Come up with something better. You're the top 10%. It's been years since I've been to Austin only as a visitor, and only as a place to pass through. My sister picked me up, we stopped at Maudie's and Waterloo, and that was it before heading off to Waco. It was so great to see my sister. We've seen each other in June for about 5 days. That's it since January. That's too long. We get to Ann Miller's funeral early enough to get a parking place. There were 1,000 people inside First Baptist. The atmosphere is not one of sadness as much as of family - everybody knows someone else in the room, so everyone is chatting and laughing until the organist plays Dvorak's "Going Home" from the New World Symphony. And suddenly everyone remembers why we are there, and what we have lost. We look at the program, where there are eight poems and some of the world's great music for the service she planned for herself, and my sister says, "Ann Miller can do anything." She really can. Her favorite song was "Danny Boy," and we learn later that the man who performs it at the memorial service played Jesus in Jesus Christ Superstar on Broadway. This was my church in college. I sat under the beautiful dome, Sunday after Sunday. The first day I walked into this building, I met the Doctor and a Future Former Roommate and some of my closest friends in the world. I haven't been inside in six years, but here we are, surrounded by friends once more. "Well here we are," says Ann Miller, and I jumped, even though the program said she had recorded her own poem to be read at her service. She says that people are always saying things are better in the afterlife, and that she doesn't know about that, because there is so much that is beautiful about earth. The poem is about that: "Look. Sometimes / here the earth dazzles us, so luminous all / blue the ponds a bed of iris the blue / shadows of the moon astonish us, we want it / never to change, the sun falling across our / faces, the light falling from trees that / blossom for us." I didn't feel like going to Texas this weekend. I had plans, a restaurant reservation, lots of loose ends to tie up. I wanted to save the free plane ticket for the fall. Seeing The Great One at the luncheon made me so glad I had come. He suddenly seems frail and tired. I say good-bye, and give him a hug, and tell him I love him. I'm so glad I didn't miss the chance to tell him that. My sister says that she learned that what feels like "home" to you has a lot to do with where you lived when you were 3 or 4 years old. Driving back to Bergstrom, I'm looking at the clouds and the great dome of the Texas sky and wondering if that's why the east coast makes me so nervous. But I get back to the city and it's cool outside, and the sun falling across my face is dazzling. It's awesome that it's been possible to buy fake election results in Kinshasa for the last two weeks. Never underestimate Congolese creativity and ingenuity. Meanwhile, the real, detailed election results are now available. 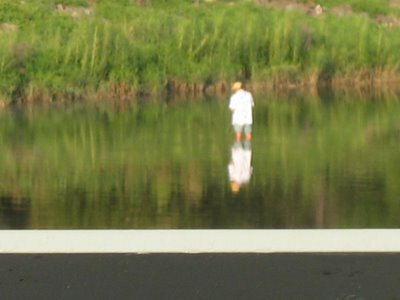 October 29 is the date for the run-off. Here's hoping they can hold it together between now and then. In other news, I now have a Bemba campaign t-shirt. It is, in a word, awesome. Maybe I'll wear it to the Willard. from Mary Oliver, "In Blackwater Woods"
Wade Burleson tries to make amends. Sortof. I'll say this: it's good to see self-described conservatives/fundamentalists/inerrantists who are willing to admit that the Baptist battles of 20 years ago were conducted in a manner that was anything but Christlike. People on both sides of the split slandered one another in Jesus' name, over and over again until so much damage was done that there is little hope that we'll ever find a way to reconcile. And I think that Burleson and a lot of the other SBC bloggers understand and regret that. Recognizing that, "There are thousands of kind, gracious, compassionate, Bible believing Southern Baptists in the Baptist General Convention of Texas and the Baptist General Convention of Virginia" is a step. Suggesting that BGCT and BGCV leaders should be appointed to SBC agencies and boards is another, although for the life of me I have no idea who in the BGCT would agree to do so. The problem here, though, is one of definition. More importantly, it is a problem of who gets to determine the definitions. Who gets to decide what it means to be good enough to be Baptist? How has determining who is in and who is out ever been consistent with historic Baptist principles of soul freedom and church freedom? The fundamentalists who took over the convention decided that they had the authority to make those decisions. And what Burleson and lots of other bright, young SBC pastors are realizing is that such a model of authority is neither Biblical nor Baptist. There are thousands of kind, gracious, compassionate people who love missions and believe the Bible in the Cooperative Baptist Fellowship and the Alliance of Baptists and a whole mess of churches that just couldn't take the fighting anymore. Maybe those of us who fit that category are too classically "liberal" for Burleson, at least to hold positions of leadership. I don't mean that in a pejorative way - he genuinely believes that what he thinks is Biblical. The fact remains that his convictions would still exclude a huge number of men and women from the SBC. To be fair, he's written more about his views of the CBF here. I just don't know if it will be as easy as he thinks it will be, especially when we have built parallel institutional structures, opened separate seminaries, divided up the universities and colleges, and hold such significant differences of opinion over issues like the role of women in the church. It breaks my heart that reconciliation in Baptist life seems so impossible. We're not called to hate each other. We're not called to pick fights and make snide comments behind one anothers' backs. We're called to love our enemies, and we'd better be really concerned about the state of our faith when the people we consider enemies are those who also call themselves Christians. Maybe that's what Burleson is trying to tell us. If that's the case, we should listen. There will be a runoff in Congo. On October 29. Thank goodness. If Kabila had won outright in this round, there would have been serious violence. In the "uh-oh" category, Angolan troops are on the border. By "troops," they apparently mean 4 battalions. That's 3,000 - 4,000 soldiers. That's invasion-strength force. They say they won't go in. They've gone in to support the Kabila regime before. And the second-place finisher's private guard got into a firefight in front of the main post office with police on Sunday. Three people are dead, including a Japanese citizen. It's strange to think of people being shot in a place I've been. Welcome to the world, baby Coker! Born last night at 8 pounds, 8 ounces. Your daddy just sent out the funniest baby announcement ever. He was so excited that he didn't mention your name, or attach the pictures he meant to send. We're just all glad your parents moved to Texas so you could be born a Texan! from going through our trash." "living for poetry, i live in light"
...The bells rang every hour from the tower in the trees. What was it going to be like, we had asked ourselves?" Ann Miller read this poem to most, if not all, of her classes. If you didn't go to Baylor, and if you didn't attend English classes up and down that giant staircase in Carroll Science or work in a tiny office on the third floor, you wouldn't know that the building is right next to "the tower in the trees" from which the bell tolls. You wouldn't know that a building with "Science" in its name is actually the English department. 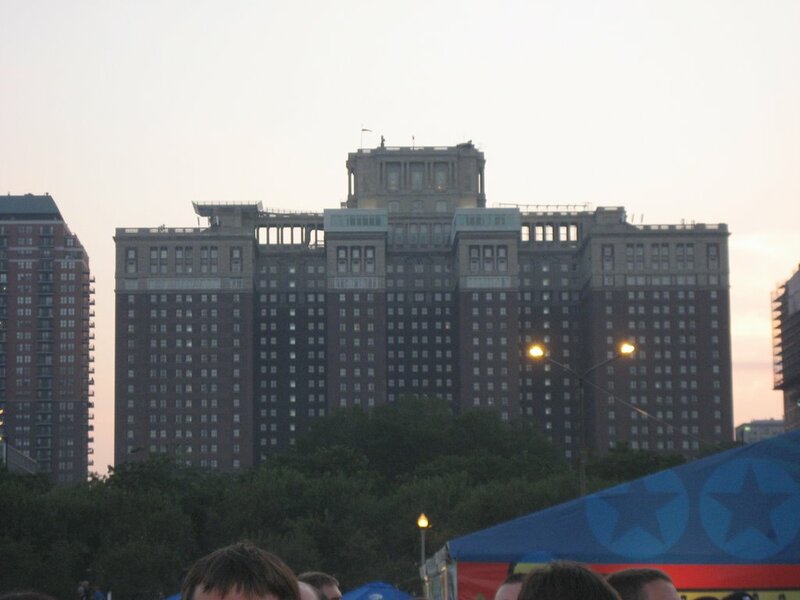 And you wouldn't know that it feels as though you are living among the treetops in that building which was built on a slope and stands tall above the Daniel fountain below. You wouldn't know that those bells ringing every hour from the tower in the trees marked the passing of each hour of your class, fifteen minutes at a time, and that the sound of the chimes on the hour could lift you even higher in times of exhiliration, or break your heart in despair. The seventh part of the poem is Baylor for me, because of Professor Miller and because of all those afternoons in Carroll Science and Draper and so many other people and places. Baylor is not like other schools. "Tell us the real meaning of life, and how to live," writes Holmes, and that was what Baylor was about, at least before some decided that they might have the whole answer to that question. "The secret of civilization was ours to ask for" - I felt that, I knew that with all of my being when I was at Baylor. And it wasn't grounded in simplistic overstatement that said "Jesus is the answer and that's all you need to know." It was complicated, difficult to wrestle with, and "Yes, worth it" every bit. That kind of college experience is rare now. My students are certainly more concerned with their picture on MySpace than "talking everywhere about new ideas." Maybe that era - now that we can all communicate with each other in a totally impersonal manner - maybe it's over. The Daniel fountain is gone, and now Ann Miller is gone, too. 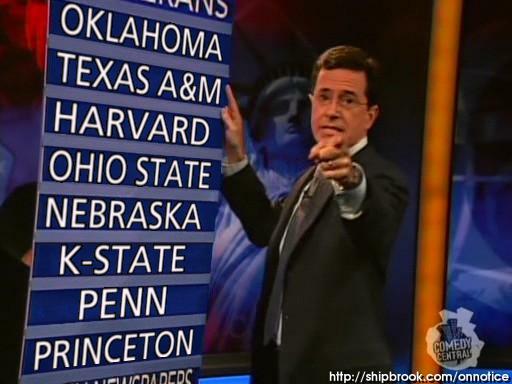 But tomorrow we will say good-bye in Waco, and remember "the professor whose B was precious, as some A's were not." We will be grateful, for the way she challenged us and the poetry she gave us. We will listen to the bells ring every hour from the tower in the trees, and we will give thanks. Those of you lucky enough to not be living inside the Beltway this summer probably aren't having to hear as much commentary on Virginia Senator George Allen's, um, unfortunate comment at an election rally last Friday. I've read way too many stories about it this week, but I just got around to watching the video today. Wow. I don't know what to say. It's much more offensive than I expected. And it' s really hard to believe that he wasn't using a racial distinction to play politics after seeing the clip and reading this. "Welcome to America" is far more offensive (especially when the guy is a native Virginian) than whatever "macaca" means. I've met George Allen, and had to deal with his staff when I was a Senate intern and he was a new senator. They were pretty clueless, as are most new members of Congress. The thing that always disturbed me about the office, though, was that Allen's staff seemed willing to do whatever Helms's people told them to do. That kind of follow-the-party-line thinking is bad for our democracy, so I lost respect for Allen pretty early on. This little incident hasn't done much to change that. How can you run for office in modern America and not have a clue about this stuff? How dumb do you have to be to say something (when you know you're being videotaped) that has the potential to alienate a huge percentage of your electorate? And how can you run as a family-values Christian when you're willing to say something that denigrates someone who was made in the image of God? "Americans in 1776 had a long way to go before making themselves strongly Christian or strongly anything else relating to a religious persuasion." - Isaac Kramnick and R. Laurence Moore in The Godless Constitution: A Moral Defense of the Secular State, a fascinating book I'm reading right now. Another great thing on the site is a list of moderate bloggers. I'm most excited to learn that Melissa Rogers has a blog! I have admired Melissa for a long time - she used to be general counsel at the Baptist Joint Committee and is now a visiting professor dealing with the intersection of faith and public life at Wake Forest Divinity School. Getting to meet Melissa (and sit next to her adorable kids) at the BJC luncheon at CBF last summer was a treat. She has good things to say about the appropriate role of religious expression in the political arena, and I am looking forward to reading her blog. Good land, my former colleague's campaign is actually going well. In one of the most conservative congressional districts in America. Tuesday night I dropped my phone. With disastrous results. The cables that connect the LCD screen and the speaker to the rest of the phone split in two. It wasn't pretty. The funny part was that the keypad and battery still worked, so I could see, for example, that my message light was flashing, but I had no way whatsoever of retrieving it. So I had to go to the Sprint store. I should preface this by saying that I hate going to the Sprint store. In my mind it's in the same category as a car dealership: a place you have to steel yourself before visiting, because no matter what happens, you're in for a long wait, a pushy salesperson, and various attempts to talk you into buying more than you want or need. Plus I had to go to McLean, which is suburbia on steroids. That makes me nervous. This visit to the Sprint store (stores would be more accurate) exceeded my expectations on those counts. After two hours, I finally had a shiny new phone with lots of features I don't need, but it was on sale, has a lot of memory, and has good battery life. Etc., etc. 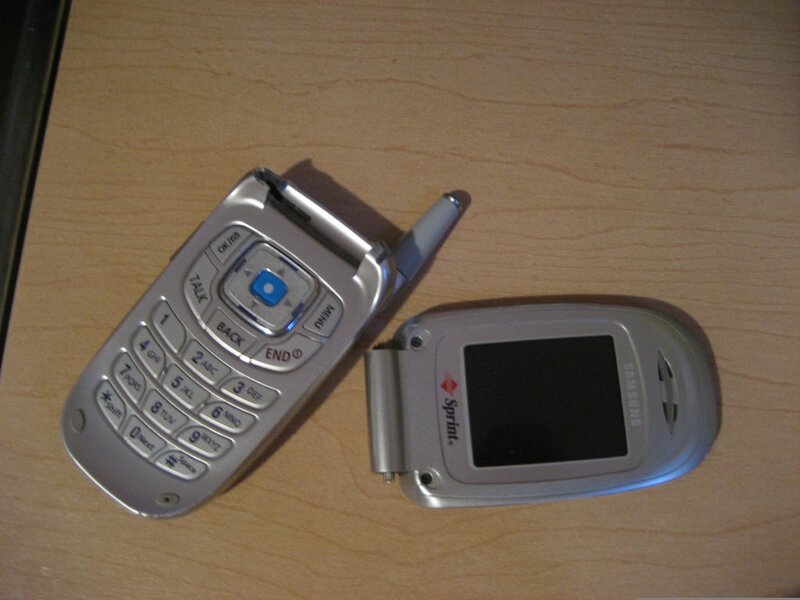 Then the attempt to get my contacts from my old phone and onto my new phone began. Seems there was an issue with the technician at the McLean store, but the one at the Reston store could handle it - "Are you familiar with Reston, m'am?" No. No I'm not familiar with Reston. Reston is even more of a suburb than McLean. And I had to get on the toll road. But after four hours, the nice technician at the Reston store managed to save all my numbers onto my new phone, so it was worth it. I guess. 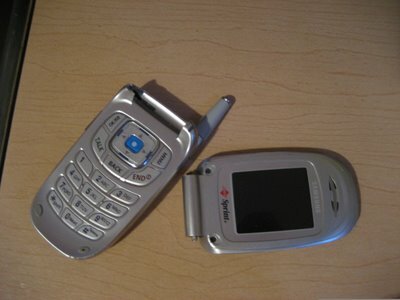 I didn't want a new cell phone, especially one with an LCD screen. There wasn't much choice on that count - every single phone in the store had one. To be honest, I didn't really need a new phone. Okay, maybe I did. My old one was pretty much beyond repair, and it was going to cost a lot to get it fixed. But I didn't want to need one. See, as wonderful as it's been to be back home, and as much fun as summer in Washington has been, I've been missing Congo lately. Thinking a lot about it, and about my friends there, and about the things I saw. People ask about it all the time, and I'm finding it really hard to put my experiences there into words. How do you talk about suffering? How do you talk about the world ignoring death on the scale of the Holocaust? How do you explain it such that your friends won't feel useless guilt, but will believe that they can take action? I don't know. What I do know is that the pretty LCD screen on my new phone contains a mineral ore called coltan. And I know that Congolese men and boys spend their lives in dirty streams trying to make meager wages by mining coltan. It's not very hard to mine coltan, in the sense that you don't need heavy equipment. It's more like panning for gold, which is terrible work for minimal wages. You can read about it here. It gets sold to middlemen, who sell it to businessmen, who smuggle or transfer it over borders and onto planes. If it's anything like the diamond market, those planes go to Dubai and Hong Kong, where that coltan finds its way into the supply chain, into LCD screens. Congolese coltan is not supposed to be used by the major electronics manufacturers. Despite the fact that 80% of the world's reserves are found in the eastern Congo, they claim that they primarily use Australian coltan. I don't buy it. I'm sure they try, but there's no way to tell where a mineral came from, especially when it makes it to a shady city full of shipping containers. All that Congolese coltan is going somewhere. A lot of it goes to Rwanda, where coltan is a major product, despite the fact that there are no coltan mines in the country. There has to be a market for central African coltan; otherwise no one would bother. And that's why I'm so ill-at-ease. Like it or not, something I deem a necessity connects me to child miners in the Congo. I don't know what the right answer to this problem is. The system we have that says that you need the latest and best of everything, and that stops making the products that aren't, it's troubling sometimes. It is both product and cause of prosperity. The whole system depends on the creation of new wants and needs, on products that are designed to not last too long. The system also gives people jobs and gives us a strong economy. Would it be better if we all stopped buying products with coltan in them? That would cause the wages of coltan miners to plummet. Do I really want to be responsible for eliminating a poor family's only source of income? Do I want to be responsible for keeping them in poverty with the low wages they currently have no choice but to accept? How would I even begin to tackle a problem this big? I have a new cell phone today. My friends and family will call this afternoon and I'll see who they are on an LCD screen. I'm blogging on a computer with an LCD screen this morning. I'll take pictures at dinner tonight with a digital camera with an LCD screen. And I hope I won't forget the cost of each one. There were lots of new visitors to Texas in Africa today (Hello, Haliburton), thanks to a very kind endorsement from Ethics Daily (thanks, Dr. Parham!) and a plug from Jim West. There are links to a number of other young, moderate, Baptist bloggers in the story - check them all out. We are trying to help build a community of young moderates who can blog on Baptist life and the culture in much the same way that the SBC has a community of young, influential bloggers. I'm not one to want to create more divisions among Baptists than there already are, but there's definitely a void in terms of what voices are out there, so I'm glad to be part of the Baptist conversation where possible. As for Texas in Africa, I'm sorry for the lack of insightful posting this week. Between Ann Miller's death and working on Monday's column, I'm a little drained on the writing front. I did, however, have an adventure today that raises lots of ethical questions, so I'll try to write about that tonight. Welcome new readers! "Well, I'm sure someone nice invented marshmallow creme, too, but it's still tasteless." - Ms. Havisham, on my phone, earlier tonight. Oh, yes she did. Last night I went to see The Beanstalk Library, which is a friend-of-a-friend's band. (Although I guess it would be fair to count the lead singer as a friend now. Semantics.) They played at DC9, which is a pretty cool little venue in the hip-n-happenin' U Street corridor. You can hear some of their music here, although the full band's sound is really different from the demos there. I was told not to comment on last night's show because "we're different at every show." So I guess I'm reserving judgment in these oh-so-influential reviews of live shows until then. That said, it was a good show at a cool venue. Their original songs were fun, if a little uneven, and they closed with an excellent cover of Radiohead's "Anyone Can Play Guitar." I'm looking forward to hearing more sometime soon. You hear lots of funny things around DC. It's such a walking/metro-ing city that you're always in close contact with strangers. Anyway, somehow over the last couple of months, I've gotten totally obsessed with DCist's "Overheard in DC" feature. Then a friend clued me in to Eavesdrop DC. Both of these are just a scream. Well yesterday, I heard the funniest series of conversations in Metro and decided to email one in. And it made it! So cool! Today we start a new feature: the TiA Quote of the Day. This will come from whatever I'm reading, or saw, or something more obsessed readers submit. I should be outraged about this. But I think they're being generous. There, it's out there. We have a freshman QB. And the kid (whichever one he may be) can't just hand off the ball on every play. It's going to be a rough September 9. This is so true. It's even worse now that they're in recess. Interns are always dumb, but nobody came to work in flip-flops and spaghetti straps back in the day when I was interning. Because we wanted to get jobs. And you do not get a job in this town if you look like -let's see, how did another sponsor put it to the Lubbock girls at youth camp one time? - oh, yes, "if you look like something you are not." This is amusing. I have to admit to having broken rule #10, but I'd argue that it's acceptable when the autograph in question came from Michael W. Smith. Because let's face it, who's going to ever let that see the light of day once seventh grade is over? I think I am seeing live music tonight. 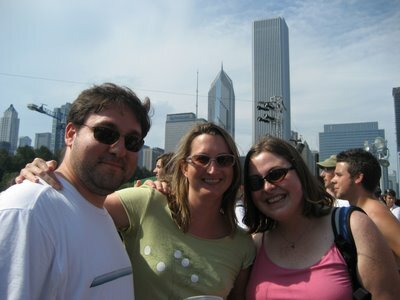 And I will probably wear my super-groovy Lollapalooza shirt, 'cause it's been long enough. "Life piled on life were all too little"
Ann Miller was one of the best teachers I've ever known. She was my English professor at Baylor. I took British Literature since Burns from her in the spring of 1998. The first thing she said on the first day of that class was, "The class before this in the sequence is 'British Literature Before Burns.' This is supposed to be 'Since Burns.' The problem with that is, you never cover Burns. So we will start with Burns." And we did. We launched right into "My Love's Like a Red, Red Rose" and "Tam O' Shanter" and "Holy Willie's Prayer." Ann Miller loved poetry with all of her being, and she taught me to love it as well. She also taught us a very important lesson - to memorize the words that you need the most to carry you through a specific time. To that end, she made each member of our class memorize and recite 20 lines of poetry. I had to go first. With Tennyson's Ulysses. It was terrifying and exhilirating all at once. And I have carried those lines, and so many more, everywhere. She loved - loved - to tell two stories. One was about the day she was walking across campus with a student and saw a couple sitting on one of the benches under Baylor's great live oaks and quoted Yeats' "For Ann Gregory." The student she was with wrote her account of that afternoon here. She would laugh and laugh at the looks on the lovebirds' faces, and quoted the whole poem to our astonished and amused class. The other story she loved to tell came with an admonition: "You should never buy, or send a Hallmark card." She usually told this one on the first day of class. The reason one shouldn't deal with Hallmark was, she declared, that those cards fell prey to the evils of sentimentality. And sentimentality is unacceptable, in poetry and in life. "When my husband died," she told us, and every class after us, "I received a handwritten note from the dean of Westminster Abbey. It said, 'One stands before the church to marry these young couples, and sees the hope and love in their faces, and one just wants to say to them, 'One day, one of you will bury the other.''" And that, she said, was worth far more to her than anything Hallmark could have mass-produced. She took our whole class over to the Armstrong-Browning Library, a place named for her mentor and which I'm certain she had much to do with getting built, and proceeded to rip apart the statue on the front lawn. The statue depicts Pippa, a character in a Robert Browning poem, and is inscribed at the bottom with the words, "God's in His heaven; all's right with the world." Pippa is pointing off into the distance and she looks to be at peace, excited, even. "This is ridiculous," said Ann Miller. And she explained that Pippa was an orphan, and she was singing that little song to make herself feel better when nothing was right with the world. "It's completely wrong," Ann Miller said. "Typical of Baylor." But she loved Baylor, for it was the place that had given her love and life and poetry. She loved Yeats, and wanted us to love him, too. She had a way of reading his poems on war so carefully that when September 11 happened, "The Second Coming" had to come to mind. "Easter 1916" is the only poem I know that really captures the sadness of losing a fight for what is just. It seemed like she knew them all, and she quoted them at will on every occasion. The lessons she taught - to not skip important links like Robert Burns, to memorize poetry because there are times in life you need someone wiser to speak for you, and to search for the right words when the sentimental ones are much easier to find - are ones for which I am profoundly grateful. She was my teacher, and she was my friend. I worked in the English department, and after her course, and after I graduated, I would stop by to talk about poetry and life. Betsy said that she died surrounded by family, and described the moment as one that was "holy." It could not have been otherwise. And in her heart of hearts, Ann Miller certainly recited some Yeats, and felt a lifetime of love and poetry "in the deep heart's core." My new Ethics Daily column on the Congolese elections is here. The weather was a perfect backdrop for a nearly perfect weekend. Friday I saw Little Miss Sunshine, which is too funny and you should definintely check it out. Saturday, The Journalist and I hung out in Silver Spring, where she lives. The last time I spent any real time near the Silver Spring metro stop was seven years ago, and it was sketch-vegas. No more. The developers got ahold of the place, and it has turned into what The Journalist lovingly refers to as Chain City. Borders, Baja Fresh, Pier One, American Apparel - it's all there. The funniest part of all, though, is the green space Silver Spring set aside in the middle of all this to have a place for concerts and movies and such. 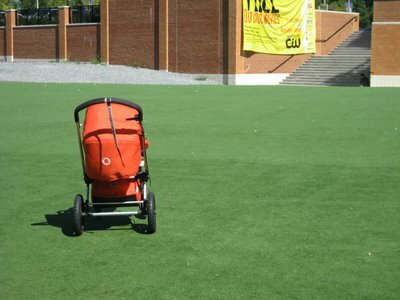 Because it is, in fact, astroturf. That's right. 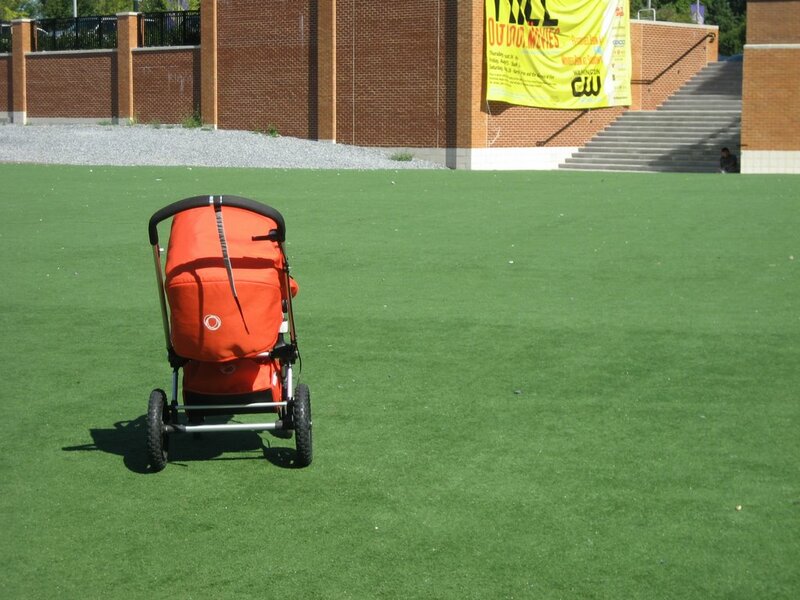 Soulless modern America, where everything looks exactly the same, now even has fake grass for children to play on. Ugh. 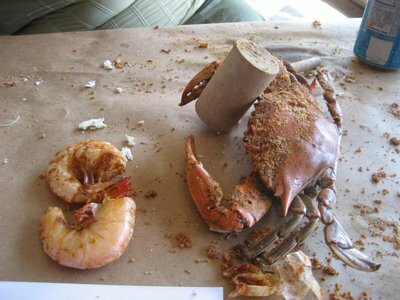 Sunday after church, I went to Baltimore with several friends. We went to Fells Point, which is a cute little historic neighborhood with lots of shops and restaurants. 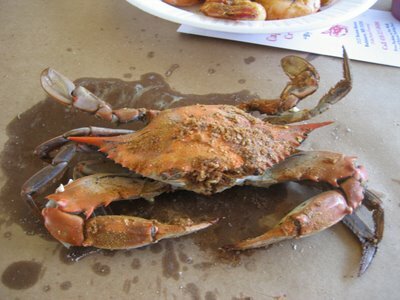 First stop was a crab shack, naturally. It was good, but we ordered a bit too much, which inevitably led to someone posing leftovers in various scenes: (I did not participate in this madness, just took pictures.) After that, we explored a cool antiques fair in the little plaza there. And, wow, was there some serious kitsch. Members of our group acquired a painting of Pope John Paul II, a Schlitz radio, a Carter '76 bumper sticker, and a needlepoint Jewish blessing. It was quite the antiques fair. 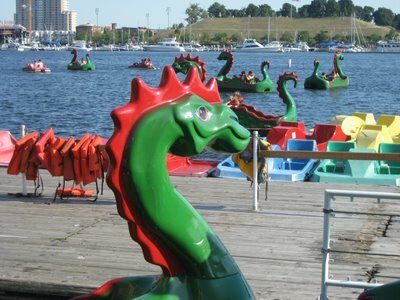 After that, we headed over to the Inner Harbor. The last time I was there, we were on a family vacation and I was 13. My sister and I went paddleboating in the harbor by ourselves. My parents have refused to go paddleboating since an incident circa 1984. 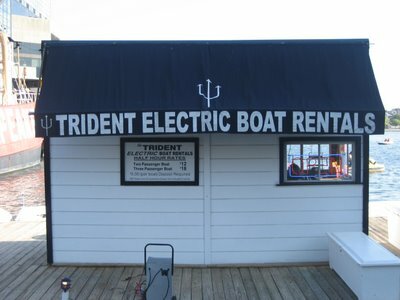 Daddy would have been pleased to know that electric boats are now an option. I think. We walked around the inner harbor as the sun sank lower in the sky and had crabcakes for dinner. It was such a fun day. The sky was blue, we went out on the water, and everything was nearly perfect. Except. In the middle of everything, someone's phone rang and we got the news that a friend had passed away. I don't have the energy to write about that right now. But it was a reminder that life is not simply deliniated between good times and bad. Wonderful days and awful days are sometimes one and the same, whether the sky is grey or an unimaginably brilliant blue. As predicted, ESPN's College Gameday Live will be broadcasting from sunny Austin on September 9. Time to start thinking of a snarky sign, and given their former-player issues, it shouldn't be too much of a challenge. Football starts exactly three weeks from today!!! WHY would they put what promises to be the most entertaining gubernatorial debate in Texas political history on the night before the OU game? Why?!? I'm following Amy Butler on this, because it's totally appealling to book addicts, and I definitely qualify. If I could, I would tag everyone I know on this question. You learn so much about a person from knowing what they like. If you try it on your blog, leave a comment! 1. One book that changed your life: North Toward Home, by Willie Morris. I read it on the first birthday I spent up north. It made me understand how home is a place, but that its meaning changes over time, and that the people you call home are as important as the space. It's also such a great history of life in the 1940's small town South, in Austin of the 1950's, and in New York City in the early 1960's. Morris was the kind of writer I wish I could be - he could write about politics, society, faith, his friends, and especially about places, all with skill and gentleness. You never had to wonder what he thought, but he wasn't obnoxious about it. 2. One book that you’ve read more than once: A Farewell to Arms, by Ernest Hemingway. Every year I read it, and every year I hope it will turn out differently. It doesn't. Tragedies never do. But Hemingway could write tragedy like nobody else. 3. One book you’d want on a desert island: Um, this. Clearly. 4. One book that made you laugh: 44 Scotland Street, by Alexander McCall Smith. I read this in Congo. It is a super-funny story about the way different lives are woven together in ways we don't expect. Smith writes it as a serial novel in Edinburgh's daily paper. The second volume, Espresso Tales, is even funnier. 5. One book that made you cry: To Kill a Mockingbird, by Harper Lee, which I did not read until I was 26. Wow, did I miss out. 7. One book that you wish had never been written: Heart of Darkness, by Joseph Conrad. It's given Westerners an easy out to classify African people as "savages" for more than 100 years now. I don't think that was Conrad's intent - he seemed to be suggesting that the heart of darkness was in the white man who tried to destroy the place - but people only remember the title and the horror, the horror from 12th grade English. And/or their viewing of Apocalypse Now. 8. One book you’re currently reading: Assassination Vacation, by Sarah Vowell. Vowell, who's a frequent contributor on This American Life, tracks down all the historical sites and artifacts having to do with the Lincoln, Garfield, and McKinley presidential assassinations. It's a scream, except that it makes me giggle on Metro a little too much. 9. One book you've been meaning to read: The Myth of a Christian Nation, by Gregory Boyd. This is awesome. Oh, yes, it's a Stephen Colbert On-Notice Generator. Thanks to the Ex-Roommate for pointing it out. 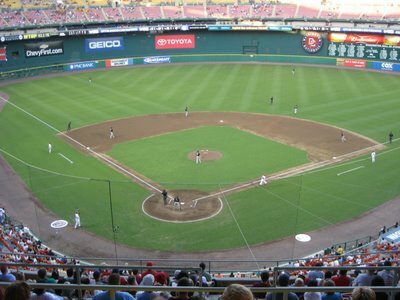 Tuesday night I went to a baseball game! 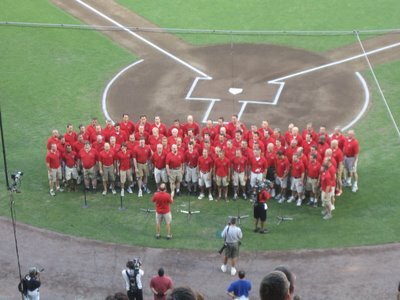 One of my really good friend's choir sang the national anthem. They were awesome (see below). I just love going to a baseball game in the summer. And our seats were great as far as cheap seats go. It was a really fun evening. My sister was supposed to fly back to the states this morning from London. She's been in Ghana all summer, and we've been so excited that she would be back today. She flew into Heathrow, took the bus to her transfer at Gatwick, and stood in a four hour security line because terrorists had allegedly planned to blow up ten flights to the United States, possibly with liquid explosives. Mom called at 7:30 this morning to tell me what's going on. My sister is okay. They have rebooked her on a flight for tonight. She had to check all her hand luggage, including her laptop and the bottle of water she always has with her. (I'd be willing to bet she's more angry about the water bottle than anything else.) She has a plastic bag with her passport and money for a nine-hour flight to Houston. And if she gets stuck in London, she can call my friend Camilla. She'll be okay. The rest of us will, too, but we would sure appreciate your prayers today. I don't feel okay. I'm worried about my mom. This is the second time mom has waked me up with news of a terrorist attack. In August of 1998, I was sleeping in when she woke me up to tell me about the embassy bombings in Kenya and Tanzania, the two places I was headed to in less than a month. It was all-too-remote and all-too-close then, too. Given the low-level of security and inattentive security I witnessed at Heathrow last winter, clearly these people knew what they were doing. I was shocked that I got all the way through security without having to show anyone my passport. I was even more shocked that the people manning the x-ray machine weren't paying attention. The question on the news is "why did they stop this plot last night?" So I don't think the plan was supposed to be carried out today. But, oh, I feel absolutely sick. 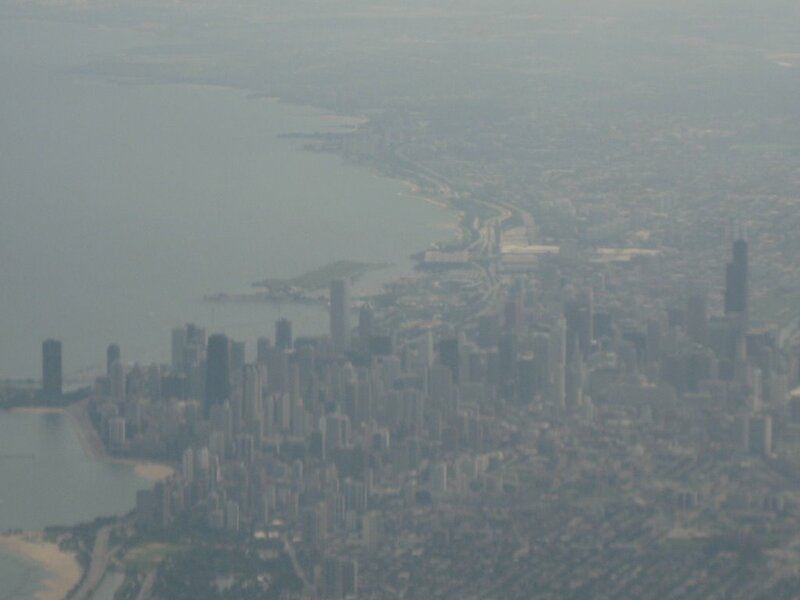 The last time I was in Chicago was April 2002, two weeks before Yankee Hotel Foxtrot came out (for real). 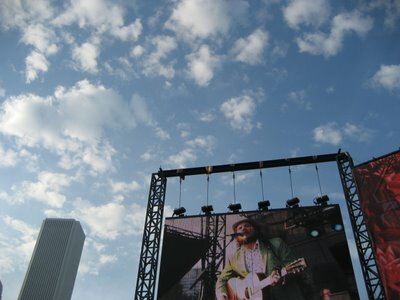 Around sunset on Sunday night, Wilco played at Lollapalooza in Grant Park. 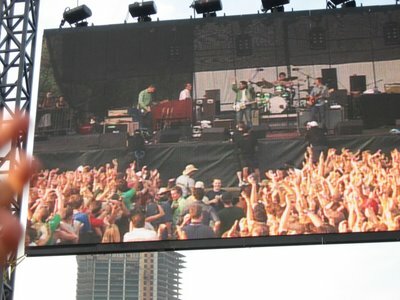 I have a bootleg of their July 4, 2001 show in Grant Park (the last one Jay Bennett played). It's not very good - you can feel the tension in the songs. 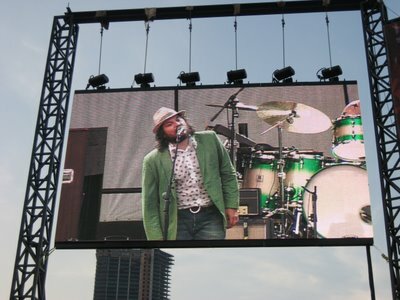 But seeing Wilco in Chicago has been on my list of things to do before dying for a long time. I've seen Wilco a bunch of times, and this show was by far the best, and I don't think it was just because it was in Chicago and I expected it to be good. The band was relaxed and seemed genuinely glad to be there. The crowd was completely into it, which definitely contributed to the atmosphere. They opened with the ever-popular "Shot in the Arm," and played through lots of favorites, mostly from YHF and A Ghost is Born. "I Am Trying to Break Your Heart" was the third song, which was pretty cool to listen to with the skyline in the background and thinking about the beginning of the movie. Jeff Tweedy told us that they're currently in the studio, and the band played four new songs to give us a taste of what's to come. And wow. I'd only heard one of the songs, but they've been playing "Walken/Talking to Myself About You" for about six months now. It was better live. "What Light/There's a Light" was okay. "Impossible Germany" is fantastic and "Let's Fight" is amazing. They've only played "Let's Fight" a couple of times live, so it was pretty cool to get to hear that. 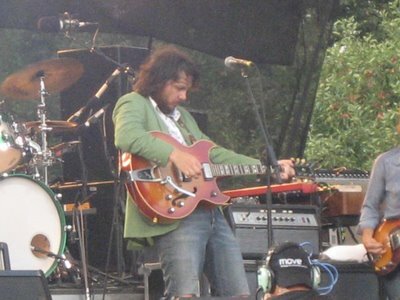 Tweedy was in pretty rare form as well. He came out wearing a goofy hat, led the crowd in clapping, and seemed to actually be having a good time. They closed with "Hummingbird" and he was actually dancing all over the stage. But my favorite part of the fourteen-song set came about halfway through when they played "Via Chicago." I've always loved that song, maybe because it's about knowing deep down that home is a who more than a where. I don't know what it was, if it was the fact that they were singing that song in Chicago, or that everyone was singing along, or that it seemed like they really meant it. But there was something about those seconds that made me happy to be alive. How did I end up in this place, for this moment? Because one night years ago, The Diplomat said, "You've gotta read this book called North Toward Home and you've gotta hear this album called Being There." So I did, and he was right, and both of those things changed my life. It's so cliched to say that about a Wilco album, but you have to understand that that was the first time I'd heard nonlinear lyrics get to the heart of what songwriting is supposed to do, which is give the players and the listeners a sense of knowing what it's like to be there. It was the first time I'd heard chords and rhythms and noisy feedback come together in a way that didn't always sound 100% pretty, but that made me understand that all of those things together meant something. And so Wilco became part of my soundtrack. The music went with me, to Connecticut and Washington and Austin and Italy and Japan and Congo, and it's explained how I've felt through big decisions, stupid boys, doubt and fear and love. A friend played me one of their songs one night a couple of years ago and said, the thing is, this song is about this one thing, but it's not really, because there's something about it that gets beyond the temporal, and it's transcendent. And that's why Sunday night's rendition of "Via Chicago," was, for me, maybe one of the best concert moments I'll ever have. I want to remember it. I want to remember what the sun setting behind the skyscrapers looked like, and how the breeze off the lake was so cool and calm. 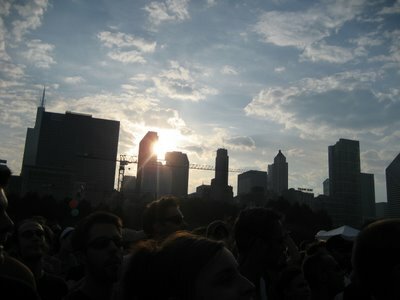 I want to remember, for the rest of my life, what it felt like to be standing under the Chicago sky, listening to my favorite band sing a song that is a part of me, and feeling what the words and the melody and the dissonance mean, in a way I can't put words to. 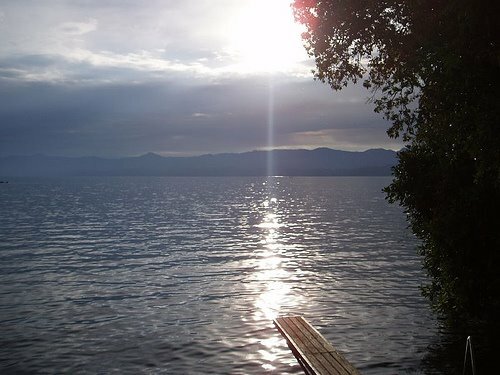 I want to remember that moment, because it was transcendent. 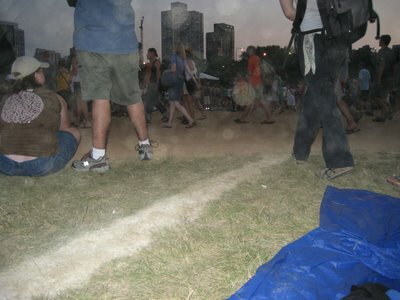 Grant Park is half softball fields, which meant that you sometimes found yourself sitting on the third base line. 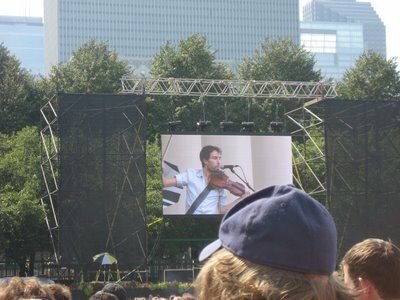 I thought this shot of Andrew Bird was pretty cool. The Chicago Hilton, site of the 1968 Democratic Convention, which led to riots in Grant Park. The Shins. They were so bad. Everyone else thought so, too. 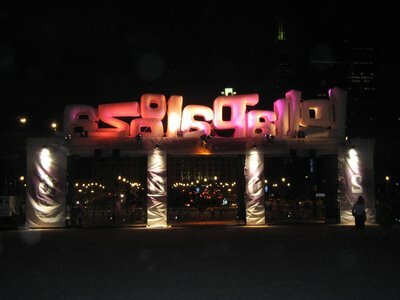 This was not the Lollapalooza of my youth. Granted, the Red Hot Chili Peppers headlined, just like in '92. But. 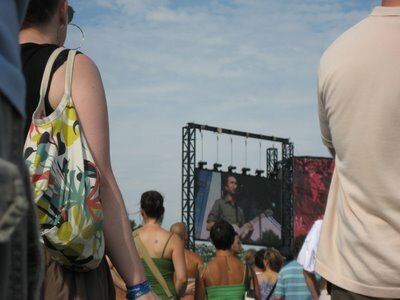 The new, Chicago-only Lollapalooza is a corporate-sponsored and produced music festival. It's pretty much like ACL. Almost exactly. Same production company and lots of overlap in lineups. The difference, though, is in the setting. 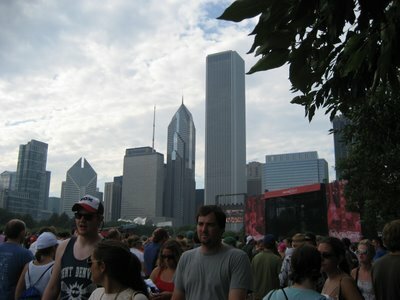 Lollapalooza is held in Grant Park, which is Chicago's version of Central Park. It's amazing - you are right downtown, in the middle of all the skyscrapers (in the city that invented the skyscraper), and on the shore of Lake Michigan. This makes things better in a lot of ways - it's super-easy to get there, you've got the breeze off the lake, and there's lots of shade. If you're as lucky as some of my friends, you also get to hear Kanye West sing "Gold Digger" from the deck of a boat on the lake. The big disadvantage of having your festival in a park that's more like a park and less like a field (Oh, come on. We all love Zilker, but we also all know that it's a field with a pile of rocks in the middle.) is that the pathways are kindof narrow. 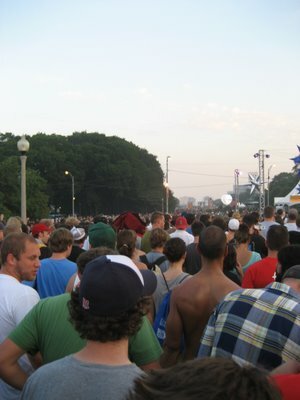 And it's a huge park - more than a mile from one main stage to the other. 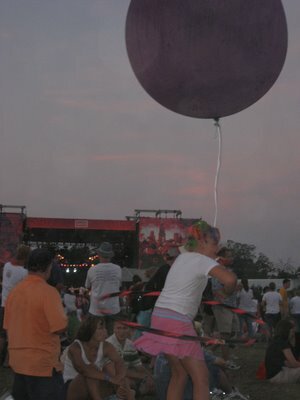 This is an advantage in that, even though there were 70,000 people at the festival, it didn't feel that way at all. But if, say (hypothetically speaking, of course), several thousand fans wanted to get from Wilco to the Red Hot Chili Peppers, they had to all go down two little sidewalks like this. It took half an hour. Which meant if you also wanted to see Broken Social Scene, you were pretty much out of luck. You could, however, relive high school by listening to Blues Traveler while waiting to fight your way out of this mess. Yippee. So we all go to grab a quick lunch while AaA's friends point out to me the skyscrapers in which they work (apparently that's a Chicago thing) and I hear a band playing a cover of "The Weight" and we realize it's Nickel Creek. Oh. My. Yeah. I had no strong feelings about the bands playing at that point, and AaA's wife A wanted to see Andrew Bird. 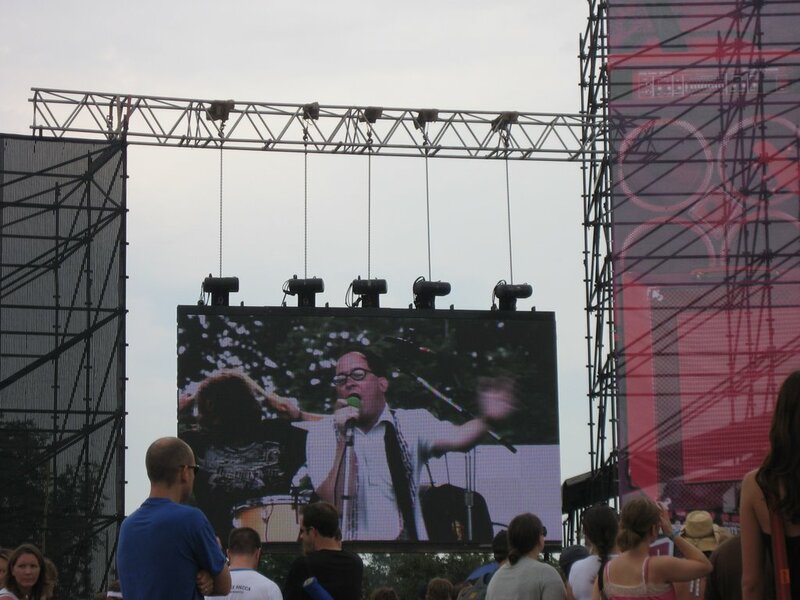 I had never heard of Bird, but apparently he's a big thing at the festivals this summer. He is, to put it mildly, a man of many talents, who reminded me a lot of Joseph Arthur, in that one-man-freak-show kind of way. Bird played guitar, violin, and I don't know what else, as well as whistling and singing over his bandmate's percussion and keyboards. It was okay. All the songs sounded the same. Eh. After that, I went over to see The Shins. I have to say, I'm not a huge fan, but I thought their set would be good. Wow, was I wrong. It was so bad. Unbelievably bad. Worse than The Newsboys-circa-1994 bad. Like, "how do they have a career if they're just a studio act?" bad. Part of the problem was the sound system, which for some reason was not turned up loud enough for anyone outside the first thirty rows to hear. But even after they turned it up, it was still awful. 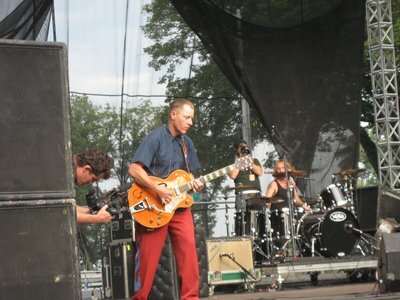 The only good thing that came out of it was that I won't have any problem skipping their ACL set to see Los Lobos. It was seriously one of the worst shows I've ever seen. So after that became completely intolerable, I decided to go see the Reverend Horton Heat, which was a blast. Everyone was dancing, the band was having a ball, and the Reverend declared that since he was tired of internet complaints that his setlists weren't good, the audience could pick the songs. So they chose "Bales of Cocaine." Natch. 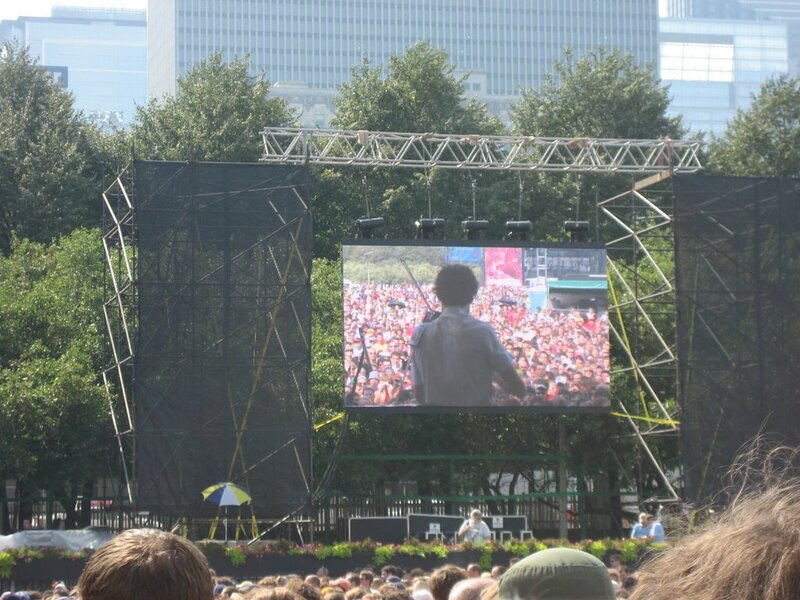 Classy, that Lollapalooza crowd. Someone else picked "Folsom Prison Blues," though, so it wasn't completely criminal activity-oriented. And it was such a fun show. 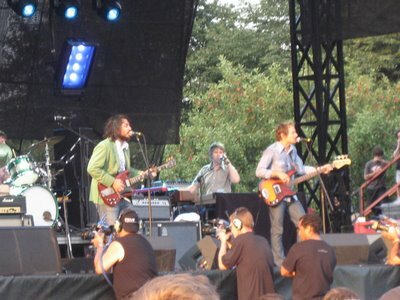 Then it was time for Wilco, which was so good that I'll have to do a separate post on it later. We had so much fun. Heard some of Poi Dog Pondering while waiting for the set to start - it wasn't too bad. 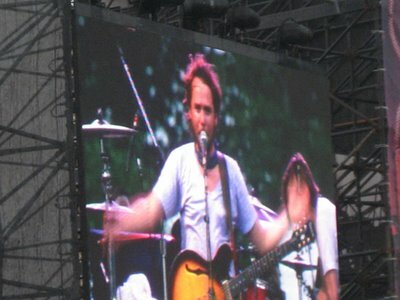 Broken Social Scene, however, was a disappointment. I was really looking forward to seeing their set, but they didn't even come close to living up to the hype. Long and painful would be the words I'd choose to describe it. I'm sure there's somewhere in this universe that you can repeat the same 13 words over the same three-cord progression for half an hour, but that's not anywhere I want to live. All in all, though, it was a fun day, and I'd love to come back another year for the whole thing. What a great weekend.